Tonight I’m doing a back to back review of two highly regarded hoppy American Wheat Ales. Little Sumpin, Sumpin Ale from Lagunitas, a pale ale made with 50% wheat malt, and Gumballhead by Three Floyds a beer made with Amarillo hops and Red Wheat. Like most Lagunitas beers, Little Sumpin, Sumpin Ale is pretty widely distributed, while Gumballhead is a hard to find beer that I’ve never been able to find in Ohio. 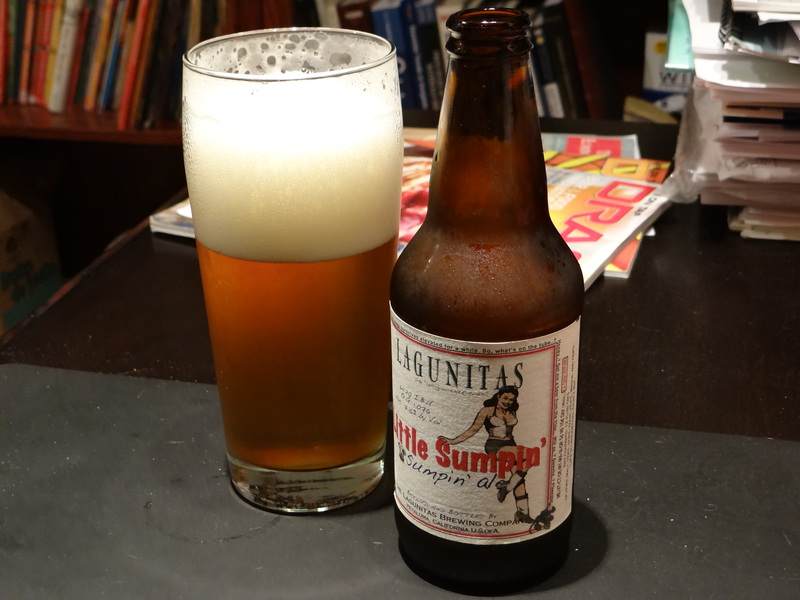 I start with a review of Little Sumpin, Sumpin Ale. The color is a relatively clear golden, amber color with considerable carbonation that leads to a big fluffy white head that takes up about 1/3 of the glass. As you can see from the picture, the head leaves behind big time lacing as it settles. It’s an attractive beer. Hops dominate the smell, with floral aromas of fresh cut hay, pine and citrus fruits. It smells like an IPA. The taste starts out smooth and not too assertive, but quickly gives way to a surge of pine oil with a moderate but lingering bitterness. The wheat malt gives it a little more sweetness and body than your typical IPA, but there is no doubt that the hops wear the pants here. In terms of citrus/pine balance it comes down on the pine side of the fence. If you are looking for an easy drinking American wheat ale like Oberon, Boulevard Unfiltered Wheat, or Widmer Hefeweizen this is not the beer for you, but if you want a smooth, piney American Pale Ale you’ll probably like this beer. While this beer gets a lot of love in online reviews and forums, the pine-wheat combination just doesn’t quite work for me.